Sealed Lead Acid batteries are often used in amateur radio as a convenient power source for radios, since amateur radio equipment has standardized on 12.6V. The Cal Poly Amateur Radio Club enjoys a steady source of donations of slightly used SLAs, so I got a few of them with need for a battery charger. 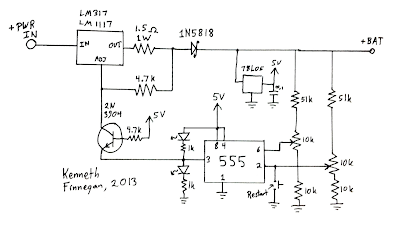 Since the SLAs are relatively small, and I only need them charged between radio outings, I opted to build a 1A constant current charger, based on the 555 Battery Charger which won first place in the 555 Design Contest Utility category. Using a 555 is a rather clever way to get two comparators and a Set-Reset latch in a single 8DIP package, which is needed for the high and low trip points. The major difference between my design and Mike's is that instead of using a relay like him, I use an LM317 as a constant current source to limit my batteries charge rate. Mike's design doesn't need current limiting since he's using it with limited power power supplies (solar panels and/or wind mills) and is charging a relatively large battery bank. Conversely, since I'm using a laptop power supply and charging relatively small batteries, I cared more about actively limiting the charge current. Constant voltage at 14.2V until charge current falls below a set threshold. Float the battery at 13.4-13.8V indefinitely. As a switchable current source, I used an LM317 (or an LM1117) wired as a constant-current source with a 1.5Ω 1W current sense resistor. Using the LM317 as a constant current source is a relatively clever use of the voltage regulator control loop to maintain 1.25V across a current sense resistor. The 4.7k resistor back to the ADJ pin is arbitrary, as long as it's high enough resistance to allow the 555 to pull the adj pin low. The 2N3904 between the 555 and the LM317 is used as a level translator, since the 555 is running on 5V where the ADJ pin will be above 14V. Once built, calibrate the two trim pots feeding the 555 so that the charger kicks in at 11.5V and shuts off when the battery reaches 14.2V. The button pulling pin 2 low forces the charger into charging mode until the battery reaches 14.2V again. Forcing the charger back into standby mode can be accomplished by pulling pin 6 to 5V, but I opted not to include that. Ideally, I would have a much better heat sink on the current regulator, but 317s are almost indestructible. When it starts to over-heat, it simply folds back the current and charges the battery longer and slower, which is fine for my application. 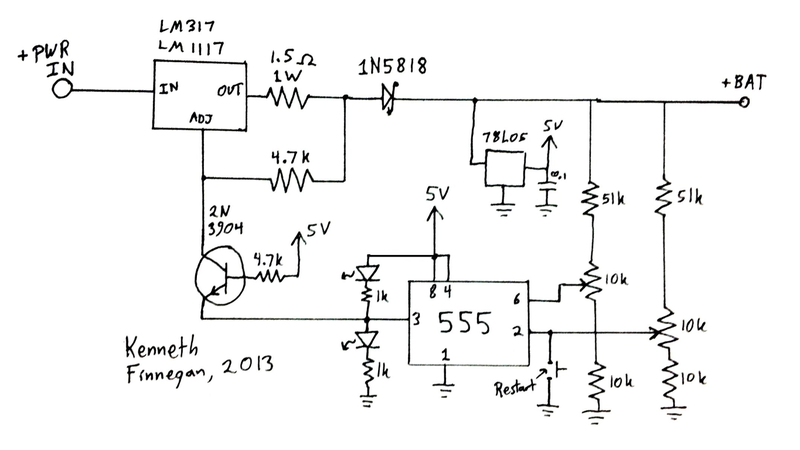 Not shown in the schematic is the switch which doubles the current sense resistor to 3Ω for a slower charge. I primarily use this to recharge my small SLAs with a 18V laptop power supply, but used the same connector as my 10W solar panel, so solar charging is an option in the future. I'll probably play with that at some point.